Dear Jesus, thank you for this day. Help me tomorrow. Amen. Sure, there were some deeper prayers. Days when I made promises (that I never kept), days when I begged for something that I should have been content not having, and the obligatory prayer for someone who was sick or dying. I even occasionally tried to hear from God… but ya know, I talked the whole time. Then one day, I really needed God. It wasn’t that I didn’t need Him before. I just didn’t know I did. But now, the fire was blazing in my home and I was left standing with 4 babies and no idea how I would feed them. Our casual faith was partly responsible for the wreckage of what we called “family life” into a thousand shards of betrayal, abandonment, and things I don’t even want to repeat. I was sitting at my desk this morning looking out the window and talking to God about the beauty in front of me when this matter of prayer hit me. Oh to think of all the times that I missed enjoying the comfort, peace, and provision of God because I was simply to shallow to really talk to Him. Oh to think of how little I made of this matter of prayer. I found myself feeling thankful that my life had changed so drastically, even though it came through hardship. But I also found myself thinking about the little people who call me mom. What was I teaching them about prayer? Was I teaching them to hurry up and pray because food was getting cold or because they had annoyed me with getting 25 drinks of water before getting into bed? Was I teaching them that sometimes we just don’t have time to pray? Was I teaching them that prayer was about getting your needs met and not really worrying about others? I realize that on this earth we aren’t going to get it all right. It’s impossible not to get annoyed sometimes or feel rushed, stressed, or even embarrassed. But the truth is, if we are going to make much of Jesus it’s going to be on our knees. And I desperately want to make much of Jesus. My kids need Him. This I know for sure. They cannot survive in this wretched world without Him. So, how then am I teaching them to pray? How am I guiding them to develop a meaningful habit of prayer? Teach them what the Bible says about prayer. This is a no-brainer, right? I agree, but are we doing it? If I had to guess by looking at my life, I’d say no. We get busy and other things take our time and energy, especially discipline issues. They have to be dealt with immediately, along with many other duties. So we push back the “teaching” of things more often than we’d like. Trust me, I know. But knowing this can help us. If we know where we are weak, we can be more intentional about changing that. There are so many ways to do this. Grab your concordance and look up verses on the topic of prayer. Study a few during family devotion times or even dinner. You might also enjoy a good family study that walks you through various prayer topics, such as Praying With Paul. Another favorite way is to have them practice handwriting as they write through Scripture. This book on the Lord’s Prayer is a great resource! Give them tools to expand what they are praying about. A few years ago, I found myself desperate for a tool to teach my kids to get outside of the rote prayer rut. I wanted them to really talk to God, but I knew that they needed things to talk to Him about. I knew that they didn’t fully understand the breadth of things they actually could be praying for. So I created prayer cards to help us fill the gap. The cards are organized into four themes, each lasting for one week–my family, my community, my nation, and my world–making a total of 28 cards. Each card emphasizes the JOY formula for praying: J-Jesus, O-others and Y-yourself. The cards encourage prayer through suggestions and scripture. I have designed them specifically with multi-ages in mind. Parents can use the cards with young children, praying and reading through them as a family. As children get older, they have the freedom to use the cards to support their own prayer life. The cards can be used on an O-ring so you can easily flip through them or you can use them in a 4×6 index card box. If you use this kind of box for scripture memory, you can add a section for the cards. Printing on card stock and laminating is a good idea, as your little ones will love to flip through them. Count the blessings and name them one by one. 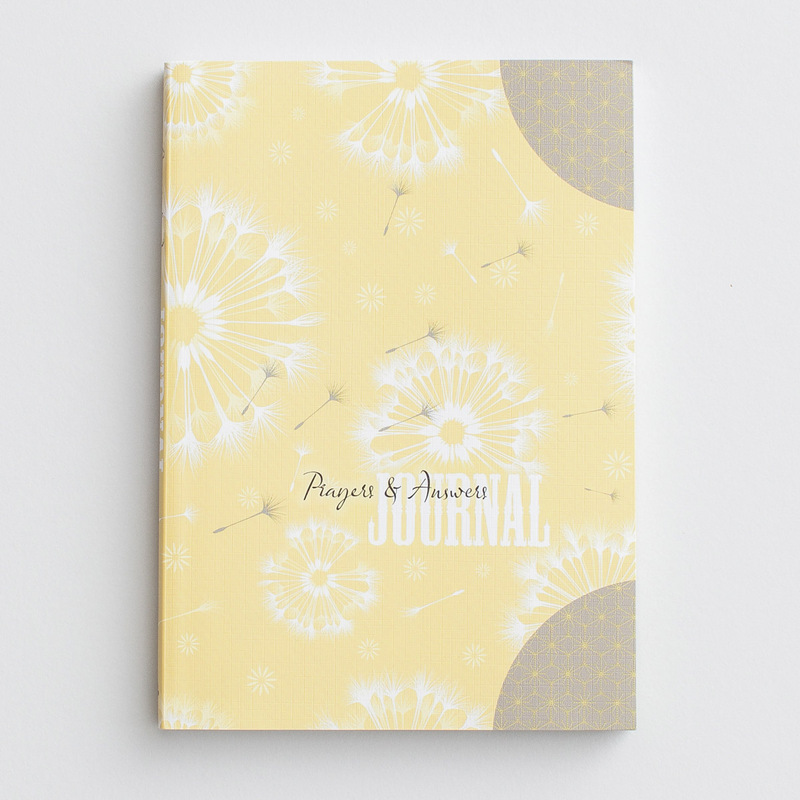 Another idea is to start a prayer journal. We actually use the cards I mentioned above and keep a prayer journal. A simple spiral-bound notebook from Wal-mart will do the trick. Or if you like something a little nicer, we have the one below. What is important is to record your requests and then note when God answers. This helps your kids see God at work in their lives. Being diligent to point this out will grow their faith tremendously! Not to mention, remembering the great things God has done is an amazing comfort when trials come. I’m so glad I came across this article. One of my prayers today is that my girls will develop a life of prayer. I actually encourage them to spend time with Jesus when they come home from school. But they really don’t want to. This article not only encourages me to stay fervent in prayer, but to seek sources to help them during their prayer time. Thanks. The link for the Lord’s prayer book doesn’t seem to be working.